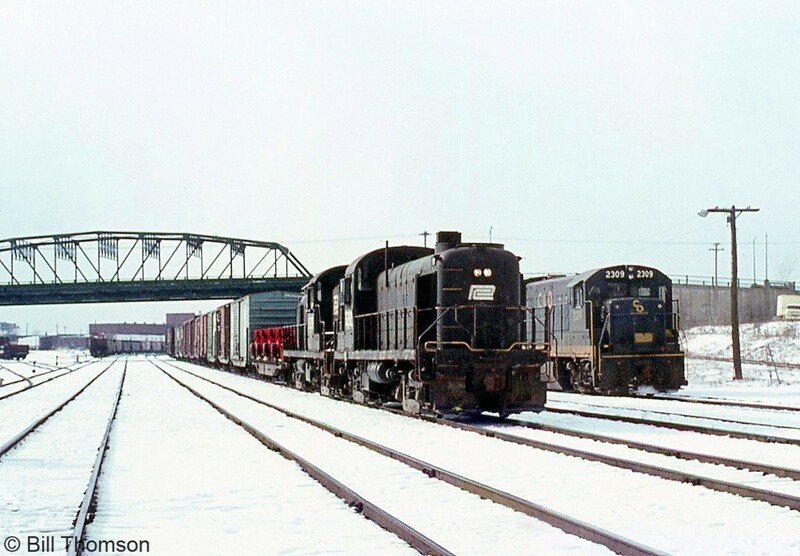 Railpictures.ca - Bill Thomson Photo: Penn Central RS3 5282 heads up a freight ready to head into the US, with Chesapeake and Ohio U23B 2309 sitting in the background near the old Central Avenue bridge on a snowy day in Fort Erie. | Railpictures.ca – Canadian Railway Photography – photographie ferroviaire Canadienne. Caption: Penn Central RS3 5282 heads up a freight ready to head into the US, with Chesapeake and Ohio U23B 2309 sitting in the background near the old Central Avenue bridge on a snowy day in Fort Erie. That looks like a load of something from Massey Ferguson just behind the power. 1973, Ontario was still very much an industrial province. What an amazing photo! Great stuff Bill.